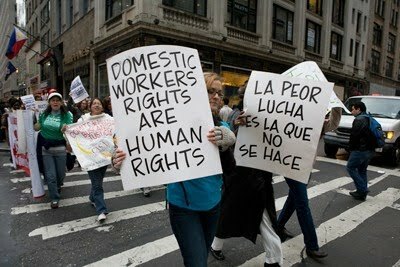 Last week, the New York State Senate approved the Domestic Workers Bill of Rights. According to the bill summary, the legislation "Enacts provisions relating to labor standards for domestic workers; includes provisions for a living wage, overtime pay, vacation, sick and personal time, advance notice of termination and severance pay; also prohibits trafficking in domestic workers; requires record keeping and notice; includes domestic workers under provisions of the labor law; includes penalties for violations thereof." Currently, domestic workers are not covered under the Fair Labor Standards Act and are excluded from the National Labor Relations Act, making them particularly vulnerable to exploitation, including human trafficking. Advocacy groups believe that this could be an important step to redressing these inequalities, particularly if the New York law sets precedence in other states. As Tyler has reported in relation to Kuwait and Qatar, the US is not alone in excluding domestic workers from basic labor protection. Often domestic labor is performed by immigrant populations, particularly women of color, who have historically been denied other basic rights and protections. This creates a vicious cycle where people who are already vulnerable to exploitation due to denial of other rights, poverty, racism, and gender discrimination, are made even more vulnerable by laws that are inacted because of racism and gender discrimination. Human trafficking involving forced domestic servitude/domestic slavery has been identified in the US. The anti-trafficking organization Break the Chain Campaign began due to "an expose in the Washington City Paper by IPS Fellow Martha Honey (entitled "Capital Slaves"), which chronicled the lives of women living in virtual slavery while working as domestic servants for officials of the World Bank and other international agencies." In 2006, two Egyptian nationals "to federal charges for enslaving a 10-year-old girl for two years and forcing her to work as a domestic servant for their family of seven at their Irvine residence." A Wisconsin couple were sentenced in 2009 for forcing a woman to work as their domestic slave for 19 years. In order for the New York Domestic Workers Bill of Rights to become law, New York Governor David Paterson must sign a reconcilled of the bill; according to New York Business, last year Governor Paterson pledged to sign the legislation. Photo from the New York Independent Media Center. The United States Social Forum provides insightful workshops about domestic workers!Interview with Liz Denorvlla on Corporate power, social movement, and progressives. It's funny how lawmakers are against this sort of thing unless it pertains to themselves.